Rereleased on DVD by Artificial Eye come two of Robert Bresson’s most remarkable achievements. Au Hasard Balthazar (1966) and Mouchette (1967) share many common themes, presenting us with a taut and distressingly bleak portrait of human frailty and a world where redemption is possible only through death. Jean-Luc Godard once wrote, “Robert Bresson is French cinema, as Dostoyevsky is the Russian novel and Mozart is German music.” Bresson’s uniquely spiritual aesthetic was ultimately his own personal response to the question’ What is cinema?’, challenging the impotence of post-war French cinema. Bresson presents us with two incredibly theoretical studies of humanity, creating scenarios where the most ordinary and pedestrian of occurrences hold spiritual meaning. These moments acquire intense significance and delicately tune the unsolicited eyes and ears of the audience towards the gentle reverberations of sorrow and hopelessness which throb beneath the tainted veneer of modern life. 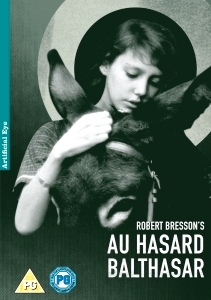 In the first, Au Hasard Balthazar, we follow the life of an unassuming young farm girl (Anne Wiazemsky) and her titular donkey. When the pair become separated, Bresson illuminates their parallel lives, with each of them encountering similar degrees of abuse and exploitation. Based loosely on Dostoyevsky’s novel The Idiot, each chapter of Balthazar’s life represents one of the seven sins, with this humble donkey’s very existence becoming a heartrending allegory for the cruelty and misery witnessed ubiquitously across the world; be it in wars, mass genocide or torture. Truly one of the most emotionally devastating films to have ever graced the big screen, Au Hasard Balthazar is an exemplary example of Bresson’s art that transcends its symbolic reverie to Christianity to become an eloquent prayer for the potential power of cinema to truly move us. Mouchette was filmed shortly after, and also centres on two ill-fated protagonists living a tortured existence in the rural French countryside. Both films present us with a world dominated by aggressive, controlling men that pursue their power by playing on the fears and insecurities of those around them. Based on the novel by Georges Bernanos, Mouchette’s titular lead (Nadine Nortier) lives a life of abject sorrow, tending to her dying mother whilst her alcoholic and abusive father (Paul Hebert) mirrors the humiliation and pain she faces at school. Our heroine’s search for sanctuary leads her into an uncomfortable situation with a local poacher, evoking a moral quandary that slowly consumes our despondent heroine. Bresson’s realist aesthetics allows sound and vision to collide in such a stringent manner that Mouchette’s existence truly feels hopeless, an unadorned and strikingly austere snapshot of the suffocating authority of oppression. Two incredibly simple, yet profoundly affecting tales, Au Hasard Balthazar and, perhaps to a lesser extent Mouchette, stand as the pinnacle of one of cinema’s most remarkable auteur’s oeuvre. Bresson’s stripped-back realism might well create a pessimistic view of the world where redemption appears merely subjective, yet hope lies within the spiritual purity achieved in both of these sombre, yet ravishing works.